Hello! This is Smallkucing "reporting" from Madras Lane, Petaling Street. Time to cari makan again. Quite a lot of things to eat here. Have all sorts of noodles and also Yong Tau Foo. A plate of Chee Cheong Fun. Came out in one of those makan show. I think it was Axian or something. Wei...gimme so little how to taste leh? Mamarazzi's bowl of Asam Laksa. Tarak "paper". There was two slices of fish. Papa said taste like Tuna fish. Fish ball Keoy Teow Soup. Taste pretty good. Papa's bowl of Pork Noodle. Hmm..taste okay okay la. Overall, it was a good meal and eye opening experience. Seems that unlike most food court, the hawkers here still practice eat first and pay later. There was a customer who ate and cabut lari(Not me). omg... im craving for koay teow th'ng!!!! Haven't been to Jalan Petaling for years... Is this the place I saw on Asian Food Channel - where it is so very dirty (even got smell) but the food is really good. I used to go there when I was little tagging along my parents. There's a stall selling ice-kacang, right? In Penang we got Madras Lane, but no Petaling street.. Our Madras Lane no have so good food there, others lanes got a lot,next time you come, i take you there ok? Haha..small kucing really sweat after tasting spicy food, so cute. sure to have been there before if you are from KL. Ah...this place. eat until sweat! but food are nice nice. I'm hungry now :). Cute boy. I would love the kueh teow soup! hmm...kucing seems to gain weight liao! I don't know where is Madras Lane..hehe. The chee cheong fun and fishball noodles soup are my favs. Alamak..hungry already lah. Oh, this reminds me that long time I didn't eat asam laksa already! Slurp! Wah, after quite some time didn't do blog visitation, now I see Joshua's body frame (chest part) seems to have grown bigger already. His face also has a little more boyish look already (rather than the baby look). Wah this one bring back childhood memory! 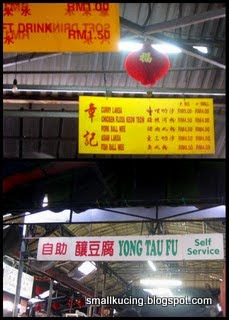 I only remember the ice kacang stall there. Hahaha! Yes the chee cheong fun came out in Ah Xian's food show.